That time of year is upon us! As I get older, wedding festivities have started to become a natural part of the “holiday season” mix, and I couldn’t love it more! There’s something about fall and winter weddings that I find to be simply magical. A soppy romantic myself, there’s nothing I love more than celebrating a love story with friends, dancing and fabulous dresses. And it seems that I’m not alone! Over the past few weeks, I have been getting tons of requests for a post on wedding guest dress ideas for fall and winter. Today, I’m thrilled to be partnering with Nordstrom to bring you gorgeous options at every price point. 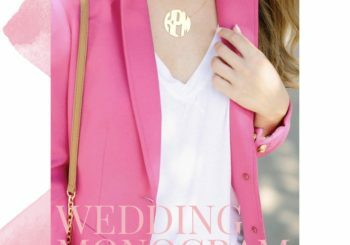 Whether you’re on the hunt for a splurge-worthy piece you can wear season after season, or more budget-friendly options for a packed wedding calendar, I think you’re going to love the varied selection Nordstrom offers. Because of their free shipping, free returns and incredible customer service, Nordstrom is always my first stop when I’m looking for something special! Me? I chose this burgundy ruffled beauty for a few weddings I have coming up this season. I always look for dresses that are not only beautiful to look at, but fun to wear since I love dancing the night away. The fun skirted detail on this dress paired with the trendy off-the-shoulder neckline made it a must-have in my book! Paired with neutral accessories (including this new clutch I splurged on) it creates a dreamy autumn ensemble you can wear for the next few months! Do keep in mind, this dress runs very short. For reference, I’m 5’2″ and am wearing an XS above. Below, you’ll find a few of my favorite wedding guest looks for every price point. Happy shopping! A lovely dress in a fantastic color and great heels! P.S. I love Sweet Home Alabama! the purple is stunning on you, kate! What a beautiful dress. Love the ruffles and color! Such a gorgeous outfit for a wedding! And really love your dress! This dress from Blue Door Boutique is similar to your burgundy off the shoulder party dress for only $44 Dollars! Obsessed with that dress! Perfect for fall weddings! What a fantastic pop of color! Every girl needs a dress as fun as that one-love it! I am in love with the dress your are wearing, the detailing is beautiful!!! This dress looks so cute on you, Kate! I love the color!